Where to eat ont the Arcachon Bay ? What are the great restaurants, the charming little oyster huts or the best addresses? Follow the guide for your next trip! The essential step of your holidays on the Bassin d’Arcachon! 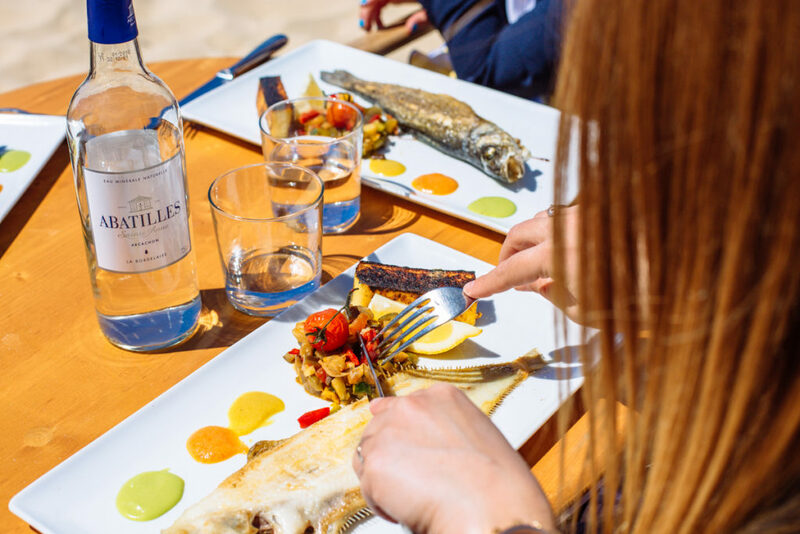 In the oyster-farming villages of Lège-Cap Ferret, you will find beautiful waterside addresses, some with views of the Dune du Pilat, or others with a flea market spirit. 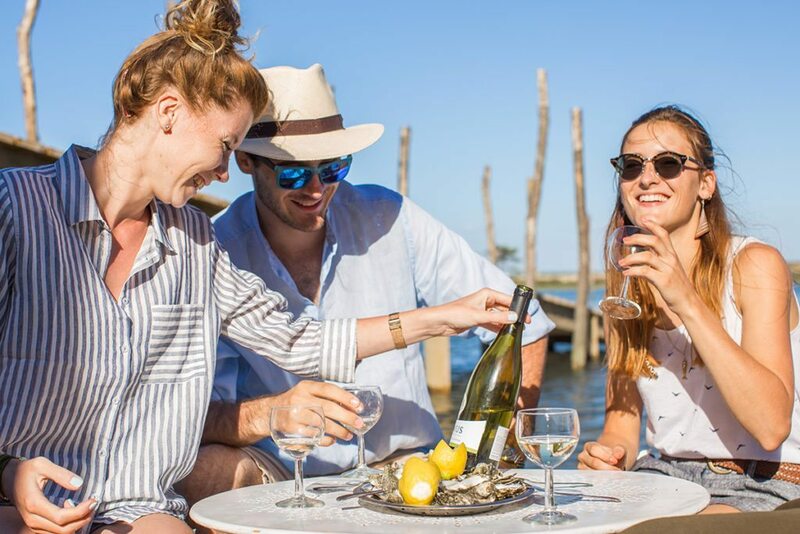 In Arcachon, you will find the only oyster house in the district of Aiguillon or go under the market hall, Place des Marquises for the atmosphere of an oyster bar. In Gujan-Mestras, Andernos, Audenge or Arès, the hardest thing will be to choose from all the pretty colorful huts. But one thing is certain, you will spend a perfect moment accompanied by a good plate of oysters, some whelks and a small white wine’s glass! With 10 towns and villages surrounding the Arcachon Bay, restaurants with views abound. Most of the time, you will find a nice local cuisine based on seafood. And some addresses offer an inventive cuisine that mixes flavors. A tip, remember to book early as soon as you have made your choice, because the best seats are often in high demand. 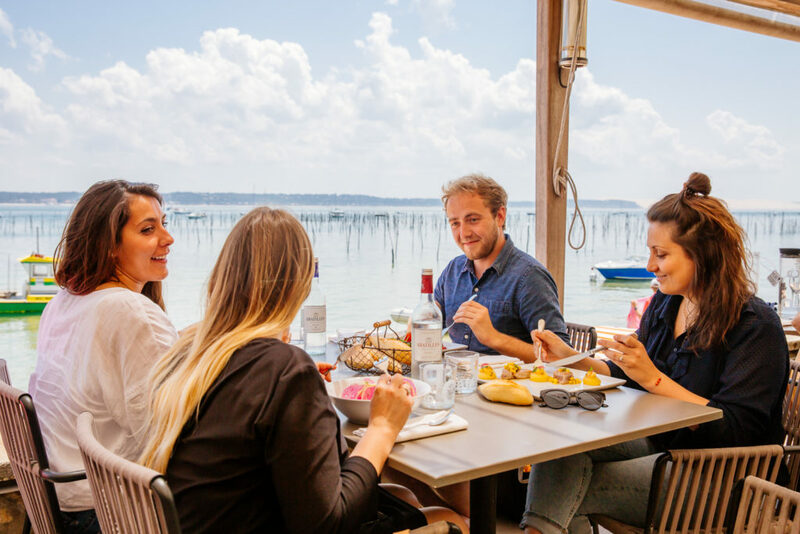 Beef tartare with oysters, sole with vegetables, or salt-crusted bar, some restaurants in the Arcachon Bay specialize in seafood. Whether classic or more unusual, this is an opportunity to taste a cuisine made with passion by local chefs, and always in a unique setting. Some addresses of the Bay offer a gastronomic and refined food. You have to taste to understand the vision of the chefs and all the passion they transmit on their plates. A happiness for your trip! To make the most of an evening or a complete weekend for two, nothing better than a beautiful romantic address to make the moment perfect. Gourmet cuisine, cozy decor or beautiful views, discover a nice selection of restaurants for a romantic couple.